You’re listening to the second half of my inteview with anarchist, activist and author Cindy Milstein as they toured with the book Rebellious Mourning: The Collective Work of Grief, published last year by AK Press. In this portion of the conversation, Cindy will share about community support infrastructures in sickness and in health, the importance of play, the Montreal Student Strikes, insights from Silvia Federici, care circles and religious institutions, anarchism and more. The first half of this chat can be found at our website really should be listened to first. Cindy mentions a documentary about the co-president with Abdullah Öcalan of the PKK who was assassinated in 2013 in Paris. The film was called SARA – My Whole Life Was A Struggle and can be watched on youtube in full with English subtitles. The film covers the life and struggles of Sakine Cansiz who, alongside Fidan Doğan and Leyla Şöylemez were taken by an assassins bullets while struggling for Kurdish autonomy. Cindy also refer to other interviews they’ve given on podcasts. Two of the more recent ones that happened before ours with Cindy were from The Solecast and This Is Hell. The worst zine can be found here. Cindy Milstein is an anarchist, activist and author who was a touring few months back with Rebellious Mourning: The Collective Work of Grief, published last year by AK Press. The book is compilation of essays by various authors about loss in it’s myriad forms experienced under cis-hetero-patriarchy, in a capitalist settler colonialism, anti-Black and otherwise racist, able-ist society. 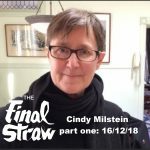 After Cindy came to speak at Firestorm Books in October 2018, we sat down for a LONG chat. 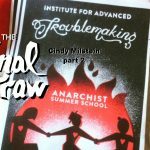 In this FIRST hour, Cindy shares thoughts on the following topics and more: a prior book they put together, Taking Sides (AK Press, 2015); the process of making Rebellious Mourning and creating “brave spaces” for engaging with hard topics; prefiguration during the anarchist summer camp they help organize called the “Institute for Advanced Troublemaking”; and multi-generational care and care-taking in anarchist communities. When I say the conversation was long, I mean that we recorded for about two and a half hours. We present the first hour here for radio audiences. We’re also going to do an out of the ordinary for us thing, which is that we’re going to release the second half along side it. You’ll find part two linked in this blog post soon, so you can listen to the both back to back if you choose. Next week, this second half will air for radio audiences but our podcast listeners will get a special treat because in place of a new Final Straw episode,, we’ll be sharing a new episode of our occasional tech security from an anarchist perspective podcast, Error451. So, stay tuned for the voice of someone engaged in spreading tools of encryption for free to help you to protect your right to whisper. 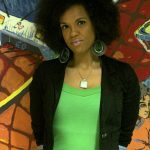 You can check out Cindy’s writings on their blog and you can find many of their books up at AKPress.org and anarchiststudies.org. 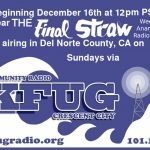 First, we happy to announce that we’ll should be airing this Sunday at 12pm Pacific time for the first of many broadcasts on the airwaves of KFUG-LP, Crescent City in Del Norte County in California. KFUG broadcasts at 101.1fm and streams on the website kfugradio.org! If you care to support The Final Straw Radio, please consider a one-time donation via our paypal or a recurring donation via our Patreon or librepay. We have items on the Patreon and our BigCartel webstore to thank supporters including stickers, buttons, t-shirts and zines, great for the socially required gift-giving holiday season. We never charge for our audio work, so if you feel like you can kick back some cash our way, we really appreciate it! Find more info at our website by clicking the Donate/Support Button. 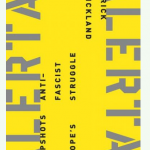 This week Gil O’Teen spoke with Peter Gelderloos, who is an anarchist and an author. 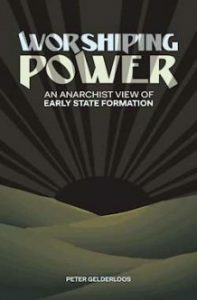 His books include “The Failure of Nonviolence”, “Consensus”, “Anarchy Works”, and most recently “Worshiping Power: An Anarchist View of Early State Formation”, which is being released two days from now (January 10th 2017) from AK Press. Gil and Peter discuss the ideas in Worshiping Power, how states usually take root, the insidiousness of democracy, the concept of how salvation religions intertwine with the state, and much more. Don’t forget about the presentation at Firestorm Books and Coffee entitled “Preparing for the Trump Era: An Anarchist Viewpoint” starting at 7pm on Tuesday January 10th. 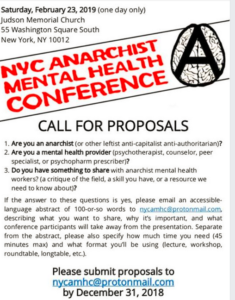 The presenters will explore various approaches to self-organization and self-defense, drawing on the principles of mutual aid and direct action. If you feel lost or uncertain about how to organize in these increasingly crazy times, come to this and get some ideas!